Howdy! I just want to share a quick post with you today. I know that most of you, are like me, and just love a sale. So, I wanted to get the word out, and let you know that Stampin' Up! 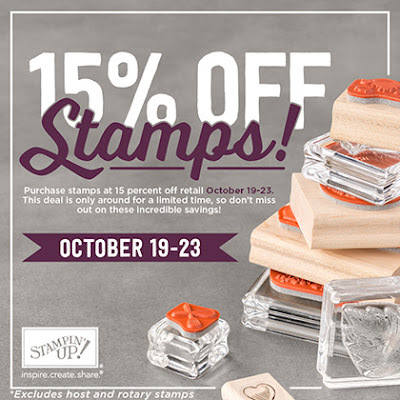 is having a sale on ALL of their stamp sets this week. You can place your order @ my on-line Stampin' Up! website. I have a link, here on my blog, on the right side-bar 'shop 24-7', or click HERE. Once on my Stampin' Up! site, click on the 'SHOP' tab, and place your order there. Your order will be shipped directly to YOU! How easy! If you have any questions, please let me know. Have a great Tuesday! and stay tuned for more images of paper crafts.